The portrait features a young woman with the head slightly turned to left; the draped, modern bust is cut down at the chest. The round face is characterized by wide, almond-shaped eyes with pupil and iris incised, straight nose, tight lips and receding chin. The wavy hair, parted at centre, is drawn back and tied in a tress covering the nape. Two short curls unfold just before the ears. 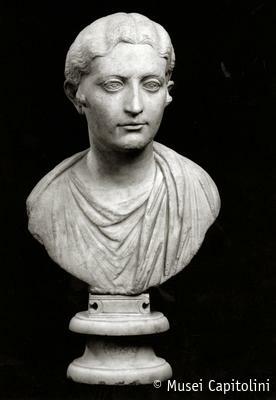 The portrait dates back to the early 2nd century AD, the age of the emperor Trajan. Formerly in the collection of cardinal Alessandro Albani, the sculpture was acquired for the Capitoline Museum in 1733.